Stranded Hearts is a lesbian romance/survival sim. 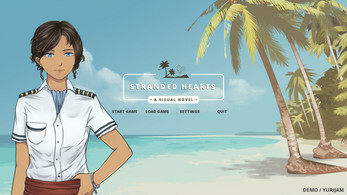 Three completely different women become stranded on an uninhabited island. As Aina Monteil's past unravels amidst the harsh survival situation, will she be able to form a genuine connection for the first time in her life? The demo/jurijam entry features the first 5 days of the game (out of 30-45). Unzip and run directly from the folder. You said you would try to finish it by the end of 2018, but it is almost the end of the first quarter of 2019. Are you almost finished? So, is this game dead? I know it looks like it, but it's just moving slowly for various reasons. Now very close to having an updated demo with 10+ new scenes, an edited intro, upgraded timer, and new/updated backgrounds. I am working hard to finish off the scenes. It's my 2018 goal to finish the game this year, so I really hope I can achieve that! So, is this game dead? Because I really want to see what comes next. Nope not dead! Just for various reasons moving slowly. Now very close to having an updated demo with 10+ new scenes, an edited intro, upgraded timer, and new/updated backgrounds. The final game will now have a story-only mode, which may or may not make it into the demo too. But then again if I keep trying to add more features to the demo it won't ever get done! Thanks so much for your patience! Glad to hear you want to know what happens next! Really cool, I'm looking forward to more! But we found "the perfect campsite" on Day 2, but afterwards the game said we still haven't found a place to live and then I died by the end. :X I know it's still in development though. ;) Nice! here is the 3 episode of this demo. I hope you all like it. well. it was great. I really like it. girls are nice and cute. And all of them have very different personalities and stories. and I don't think "survival-mode" is hard. Rather challanging. 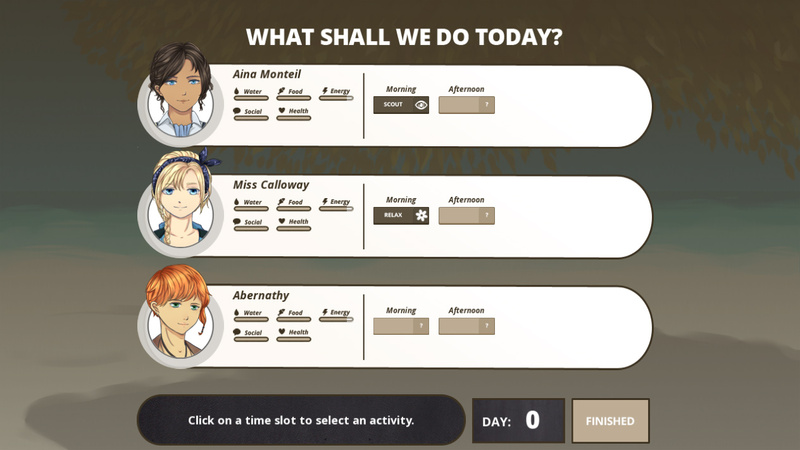 :) If you remember to save at least once per day in time of game (the best option is to use different slot everytime) and read description of every activity. here is the sec episode of this demo, I made it some time ago but never really got around to release it but here it is. I hope you all like it. Thanks so much for taking the time to record these two videos and voice all your thoughts. They were so insightful! You make some really good points about the menu and whether certain buttons should or shouldn't show up. As you say, it doesn't make any sense to go into "Settings" from Settings. This is definitely something I will look at. You were right that we didn't create controller support. I was just as surprised as you that it worked (sort of)! I think it's an inherent part of the engine we used, so I will have a proper look at controller support for the final game, including things like the Settings. Well spotted about the load game menu - it's got the wrong z-order for the border! With attention to detail like that, you make an amazing QA tester! Your observations about the text moving up and down really interest me. I can't figure out what sort of setup you've got that it would get in the way. Perhaps I should add an option in the Settings to stop the text box from moving up and down, so you could keep it just at the bottom of the screen? 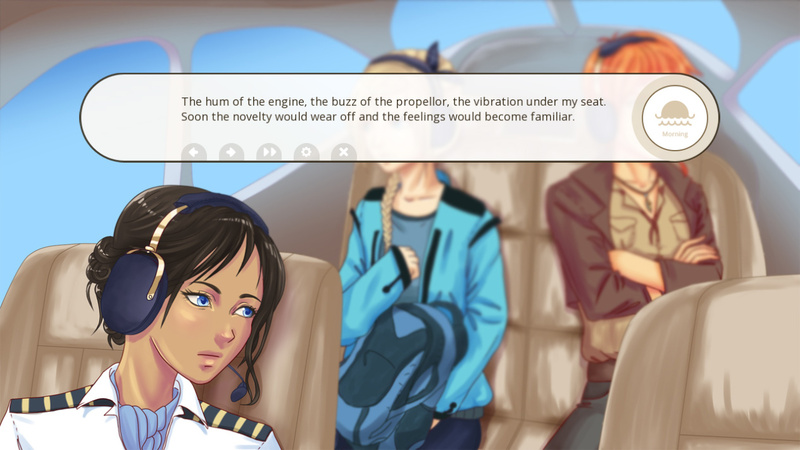 One of the main reasons for implementing the changing of position was to increase immersion, as the text box obfuscates the faces of the backseat passengers and focuses the scene on Aina, below. I noticed you didn't comment on the timed options - wondering what your thoughts are on those? Thanks once again for taking the time to record these videos! I don't have time now I may have a little tomorrow and some on Tuesday and Wednesday so I may look into the game again. BTW I have replied you on youtube. And again thanks for a great reply I'm glad you took the time too watch them and took what I said to heart I have been taking a break from VNG since I played a lot of them but I may go back again and play them again. 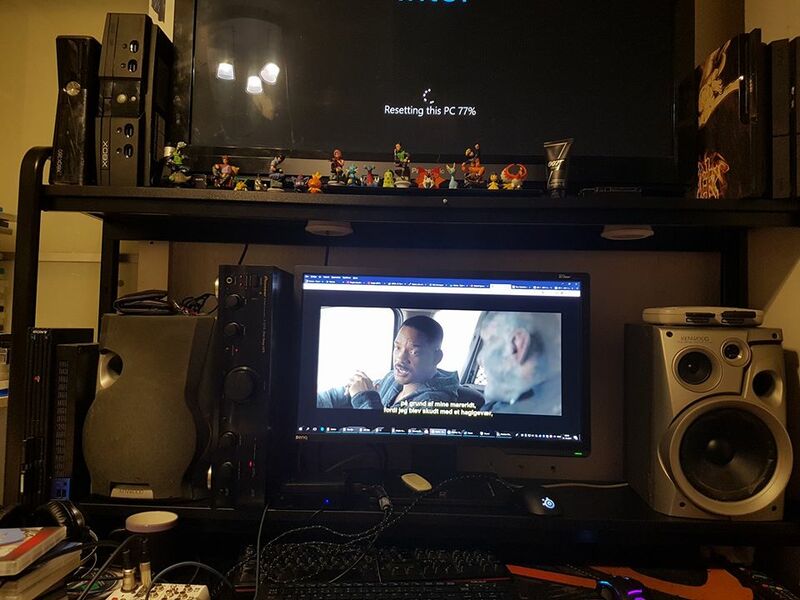 About my setup here is a look. Thanks so much for sharing this - it explains a lot!! And also why you would like to have controller support! Thanks again for the insights!! Almost cried when i saw the OG xbox :'D all the memories of my childhood playing TES: Morrowind, Enclave and Star Wars Knights of the Old Republic! Has the development of this game resumed? If so how is everything coming? I have high hopes for this game :D it seems really interesting and I really hope I can get to experience this game in it's entirety soon! Hey! Thank you SO much for getting back to me :D I hope everything goes well! p.s. sorry for a late reply I have been really busy with all my classes and I haven't been able to make much time for myself so I haven't gotten around to replying until now :[ Also i hope you are having a wonderful day! I think the demo is about 30-60 minutes, depending on how quickly you read and how quickly you can plan your day. Most people die the first time they play through, so if you were trying to get to day 5 without dying, you might need to reload and try again a few times, which adds a bit of extra play time. There are also some scenes in it that will only happen if you choose for the protagonist to do an activity at the same time as Kim or George, so if you were trying to get all the scenes, so getting all of that content also requires trial and error. The final game will probably be about 3-8 hours of gameplay, again depending on play style and whether you want to get all endings, etc. It's really hard to estimate, actually, as I haven't timed people who play it for the first time (yet). 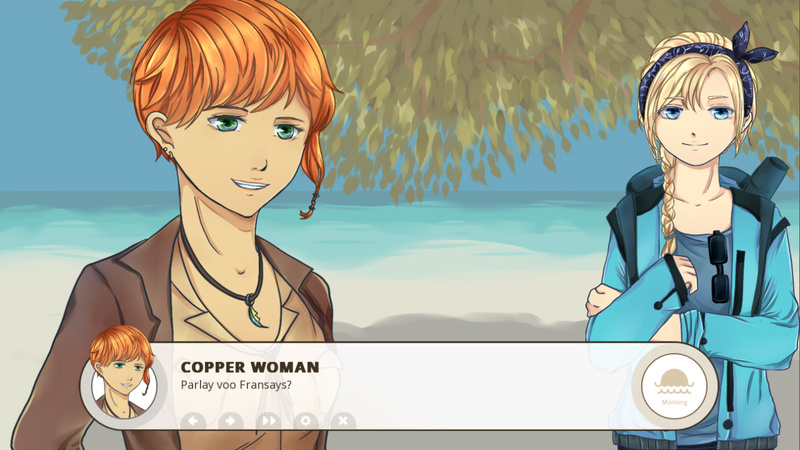 It's based on roughly 60k words of VN scenes, plus the (challenging) survival aspect. If you're only interested in the story, and are a fast reader/skin reader, it might only take 2 hours to play through on VN-only mode. TL;DR: 30-60 minutes for the demo, 3-8 hours for the full game with survival, or 2-4 hours for the full game in VN-only mode. It took me a while to download but it was all worth it! I only survived a few days though im not that good hahahha well overall this is a nice game! great job! looking forward for updates on this! Thanks Chua! 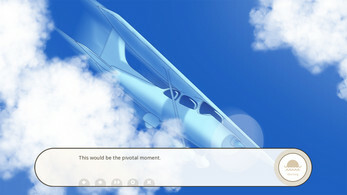 I think when the final version comes out, there will be a VN-only mode and maybe even an easy mode. A lot of people have said it was too hard to survive, so you're not the only one!! Hi Kiba! Thanks so much for checking in! You're right, we haven't posted any updates in a while, but development is still on-going, albeit slowly. Working on backgrounds at the moment. 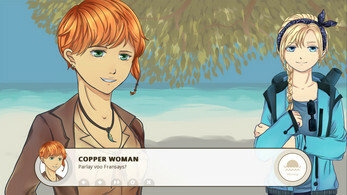 Thanks so much for checking out our demo - can't wait to see your video and hear your thoughts! yeah, I saw that later on, on patreon https://www.patreon.com/steamgirl I do support you there and like I said there "Idk if I have more money this month, but I wouldn't mind supporting with more than just one dollar if it helps the process of the game." This was a really good game. It took me several attempts but I finally made it through without anyone dying. I'm looking forward to the main game's release! Are you able to download other itch.io games? Does it show any error messages? Really looking forward to this game, played the demo and found it great fun, including the realistic dying several times, nice to feel challenged and added a extra depth that made the game stand out for me even more. I read below that the release date would be in this month or the next, so I will keep checking back for updates. Hope all is going well with you guys and that the coffee is strong and delicious! Hi Ending! Thanks for leaving a comment! I am glad you enjoyed the demo - including the difficulty level! We are doing our very best to get the game out ASAP but a lot of the team members were busy during March (for example with NaNoRenO) so it might take a bit longer than expected. As for when the game comes out... we took a break for a couple of months but work has restarted. The game is actually very close to completion but the writing needs some editing/polish, and there's a CG we still need to make. But hopefully it will be finished in March or April. Just saw this game (and your reply) today and was wondering if there is a planned release date yet?